THIS MOST ELEGANT OF STOPPARD plays is, I think, best viewed live — the 1990 film, for all its polish, loses something as it’s translating. Live it should be: for “live” is what it’s about, and specifically but not exclusively: Does life make a sound without someone else to hear it? Or is it a series of borderless scenes with no walk-off? These are the questions pondered by two minor characters from Hamlet as they wait for something to happen. No one knows the answers, but one thing is certain: the curtain will, inexorably, fall. For me, R&C’r’D will always be the stuff of all-night wordbinges laughing with friends into the post-adolescent dawn; the perfect accessory to a 1970’s high-school backpack stuffed with On The Road, Tao Teh Ching and the latest issue of Heavy Metal. Two ELIZABETHANS in a place without any visual character. They are well dressed — hats, cloaks, sticks and all. Each of them has a large leather moneybag. The reason being: they are betting on the toss of a coin, in the following manner: GUILDENSTERN (hereafter “GUIL”) takes a coin out of his bag, spins it, letting it fall. 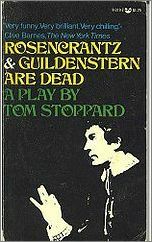 ROSENKRANTZ (hereafter “ROS”) studies it, announces it as “heads” (as it happens) and puts it into his own bag. Then they repeat the process. They have apparently been doing this for some time. Gary Oldman was brilliant (sorry, Ann) in the film.